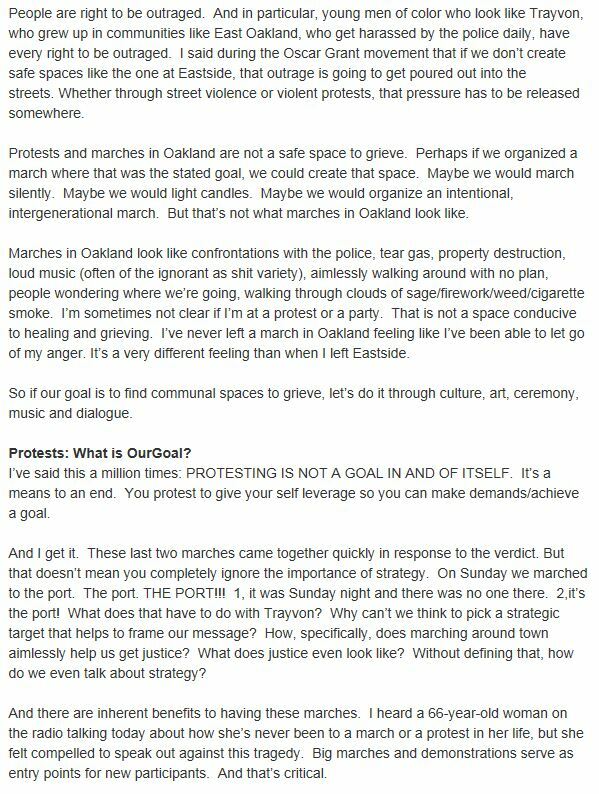 Notes on effective #Oakland protests. 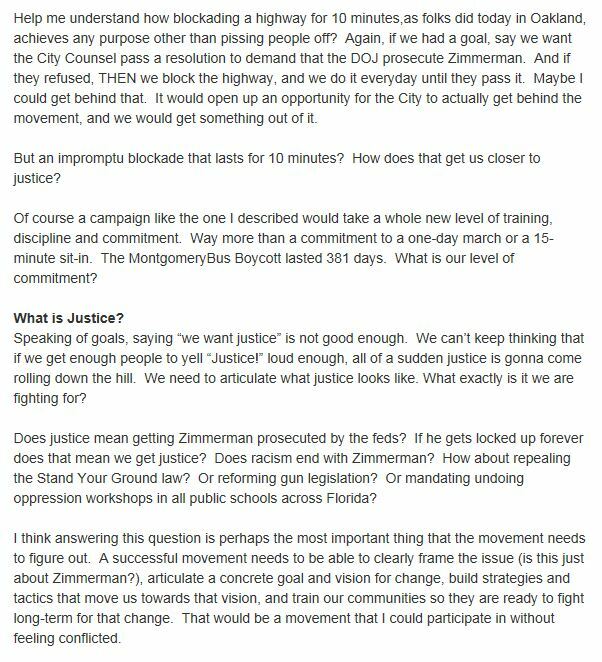 With the anger and frustration coming to a head in regards to the George Zimmerman verdict on Trayvon Martin’s murder, many are questioning the effectiveness of spur of the moment protests. I have shared my frustration over protests that result in broken windows, violent outbursts and the collateral damage towards grass-roots organizations that serve low-income people of color. Collateral damage against Oakland institutions like Awaken Cafe or Youth Radio and movements like ads for “Fruitvale Station,” a movie trying to tell the story of Oscar Grant. Awaken Cafe Window sign in response to protests on Sunday night. 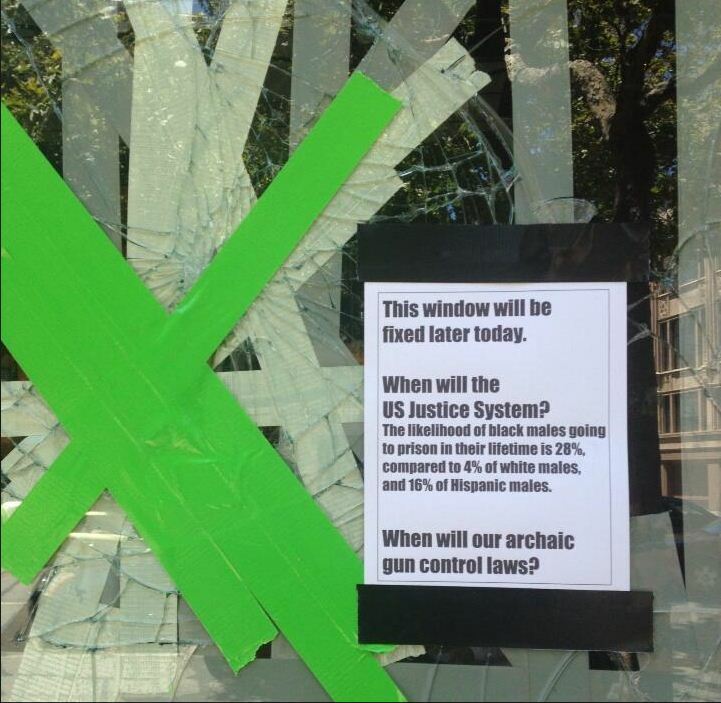 Broken windows and glass can be fixed, but what can’t be fixed is the allienation of people and organizations that are actually trying to help Oakland. What spoke volumes to me was the looks of disgust, embarassment and sadness of residents who are confronted with the mess that was made last night on their way to work. People who might have been valuable allies. 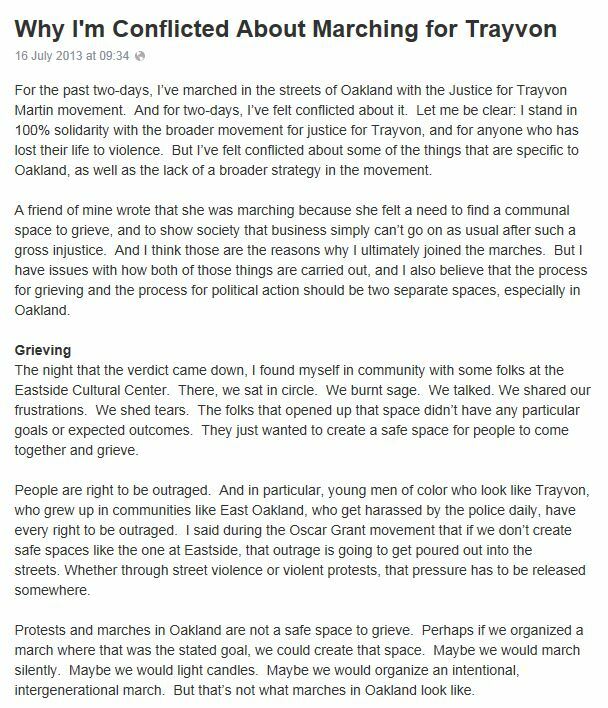 Not only do you damge our city, but you take the focus off of Trayvon Martin and those like him and you place it on how ‘violent Oakland is’ .. a meme that the media just LOVES to capture. So..what should we do in response to the verdict? In response to the injustice against young black men and against low-income people of color? My friend Kazu Haga, who worked with Positive Peace Warriors Network said it eloquently for me. For those who aren’t on Facebook, I have captured his words in these photo snippets with his permission. Positive Peace Warrior Network gives trainings on Kingian Non-Violence, a peaceful approach to organizing. I took the training..and I highly recommend it. Kazu will be doing local trainings in peaceful organizing and you should check him out if you live in Oakland. 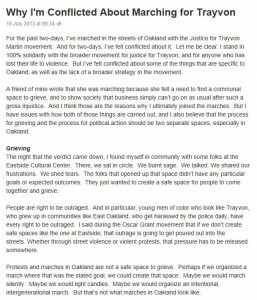 If you are on Facebok here is link to the note he wrote – “Why I’m Conflicted about Marching for Trayvon” . Join the conversation. 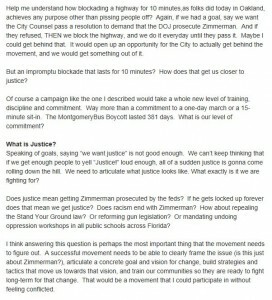 Here is the text in Word Document to download and share with fellow organizers: Trayvon. I have copied the text via screen capture photos. Click on the photos for bigger view. If you are on Facebook.. Join the conversation. Respond with your ideas to this post as well. Let’s come up with effective solutions. The time for mindless anger has past. Lets create a space for peace and real change. 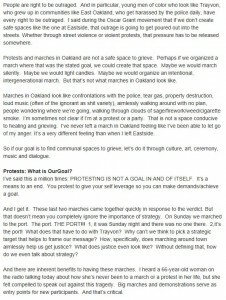 One Response to Notes on effective #Oakland protests. In February 2011 many Egyptians were finding their voices in the streets of Tahir Square, challenging their repressive government. But it was hard for women to participate. In a society which expects women to cover their heads in public and to be subordinant to men, young women felt they were caught between two conficting causes. In Oakland we are so angry about the murders Oscar Grant and Trayvon Martin that we want to shout and throw things… but at the same time Oakland is our home, our place to protect. 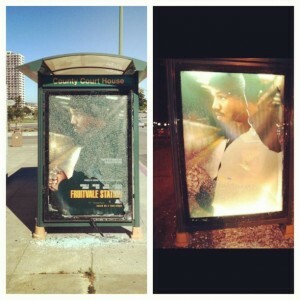 Are we protecting other young men from the same fate of Oscar Grant by throwing bricks at bus stops and into cafe windows? I just wanted to share her integrity. Months later security forces grabbed women protesters from the square and beat many of them, others were subject to “virginity checks” and other horrendous humiliations. All we need to do show up and speak out. We will be heard better without the sound of crashing bricks and breaking glass.